I’ve signed up for Monthly Collage, at the end of every month they email you a collage of your Instagram pictures. I’m doing a photo a day on Instagram so it’s a pretty nice round up of the month. Here’s my January. I’ve always loved taking pictures. My first camera was a hand me down when I was very young, since I had that I’ve never stopped taking pictures. Pictures of people, many more of places, capturing everything I wanted to remember and revisit and then some. Last year I did a photo a day challenge, posting a picture on Instagram every day, and this year I’m doing the same. One of the things I want to do this year is to improve my photography. I’m content enough with the photos that I take but I know there’s so much I can still improve. I’m in the process of finding some blogs to follow (any recommendations will be gratefully received) but want to do more. Facebook’s bizarre algorithm that shows you the activity of your friends led me this evening to discover Emma Davies Photography’s free online course A Year With My Camera so I’ve signed up for that too. Hopefully you’ll see the results over the course of the year! Friday Photos is a weekly challenge hosted on Flickr where people submit up to three photos taken that week for the theme. Each week I will blog my entries. Week 3’s theme is Water. My favourite way to drink water. I chose to use photos of my two favourite ways of drinking water, either mixed with a teabag and milk or put through my beloved filter machine. Week 2’s theme is News. 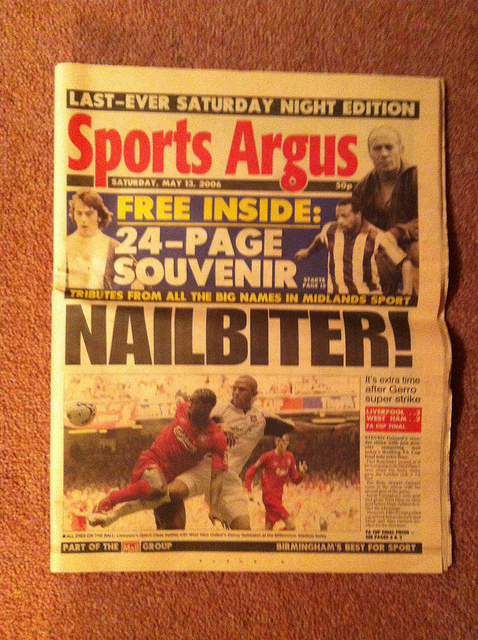 Just one photo this week, the Sports Argus was a hugely important part of my weekly routine until it sadly closed in May 2006 with this final issue. A Flickr group posting photos every week but with a bit of a thematic challenge. The theme for the week will be posted here in discussions every Saturday throughout the year. Photos can then be posted up to and including the following Friday. Please encourage people to join, we’re a friendly bunch and all love looking at each other’s photos. I haven’t had much success completing photo challenges before, I usually end up making it a few weeks in before forgetting for a couple of days and then giving up. I’m hoping that the weekly theme will help to jog my memory and get me through ’til the end of the year. Week 1’s theme is Socks. I wanted to try and think of something a little imaginative but failed, so here are my 3 pictures for the theme. Feet ready to fly away. Why not think about joining the group and the fun? The London 2012 Torch Relay. The Olympic Torch is in Wales at the moment on its journey around the UK. It arrived in Aberystwyth yesterday evening and this morning headed off on its way to Bangor where it is spending tonight. I live a little north of Aberystwyth so it was wonderful this morning to see the torch taking the route I use every time I go into town. 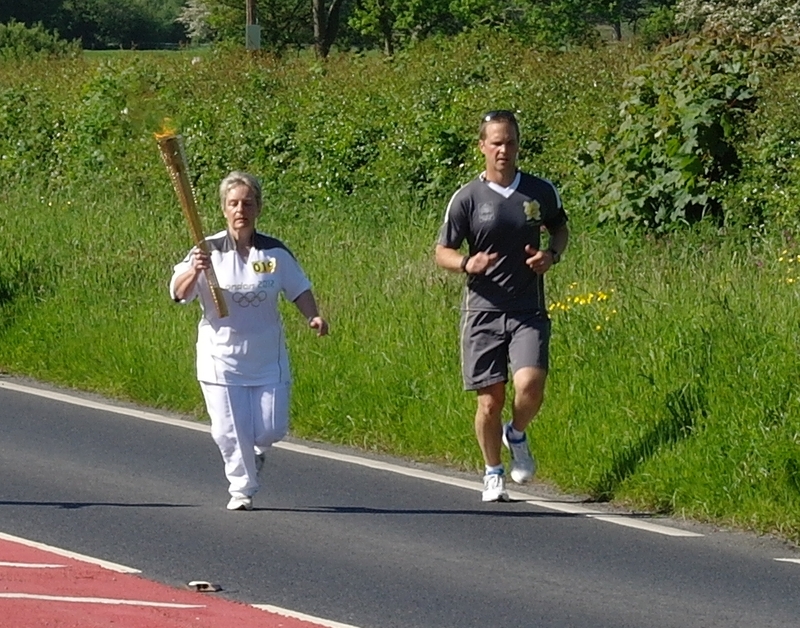 I went to see the torch in Tre-Taliesin, watching its final leg before it was transported by coach to Machynlleth. According to the website she is Caroline Orrells from Newton, her bio is here. The rest of the photos I took are on my Flickr here. It was very quiet where I watched it compared with some of the images I’ve seen, but for me it was no less impressive. I’ve been looking forward to the Olympics coming to the UK for ages now, and seeing the torch for real was I think the thing that really brought it home to me that it’s really happening. I loved as well knowing that my parents and some friends have already watched the torch go past, and more family members and friends will see it in the weeks to come – we’re all scattered across England and Wales, but we’re all sharing this experience.